Klout Gets Inside Bing: Kling? Blout? Bling? By now, it is not news that Klout Expert posts are going to start showing up at the top of Bing search results. The Bing-Klout partnership began in September of 2012, with Microsoft promising at the time that this was only the beginning. Apparently, they meant it. Now, posts from Klout Experts will begin to appear at the top of Bing search results. Concurrent with this new feature in Bing, Klout has also announced a new feature: Experts, a Q and A service which seems to be a swipe at Quora, but which allow users to demonstrate their expertise and influence by providing answers to other users’ questions. Answers which can be +K’d by other users. Sounds a bit like a Google +1. And that’s where I think all of this is headed. The further integration of Klout into Bing, on top of Bing-Facebook’s Graph Search and it’s integration into Bing search results, looks like an attempt to produce a strong competitor to Google, G+ and Google authorship. Well, it’s not a bad idea, assuming Klout can become a better indicator of influence. Klout’s limitations in this area are pretty well-known, so I will not go into them. But, if Klout scores do not become more reliable, this might end up being nothing more than eye candy. On the other hand, with the addition of the Experts feature, it could become a brilliant branding opportunity, especially for small businesses and consultants. Either way, Microsoft’s ambitions to build the definitive social search ecosystem are taking shape. It’s not hard to imagine Klout pulling people away from Quora; wouldn’t it just be smarter to post somewhere that offers the real possibility of appearing at the top of SERPs? It could also steal activity from LinkedIn Groups. It’s also not hard to imagine that the Google and Bing/Facebook/Klout ecosystems will become increasingly self-referential and walled off from one another. Klout already suffers from limited access to Google data, i.e., no access to Google+ brand pages. Of course, only time will tell. 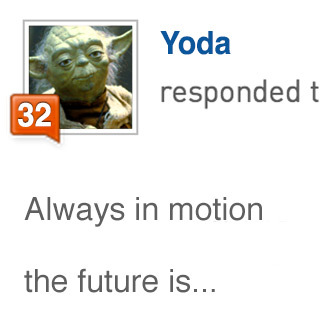 As a wise little frog-man from Dagobah once observed, “Always in motion the future is.” Well, Yoda, play your social cards right and that pithy answer might show up at the top of a Bing SERP, along with your Klout score. What do you think of Klout? Would you like to be a Klout Expert? This entry was posted in Blog Contents, Search Engines / SEO / SEM, Social Media and tagged Bing, Google, Klout on May 9, 2013 by Administrator. I'm a marketing and communications professional who lives in the Chicago area. I specialize in the broad practice of Inbound Marketing, including Online Marketing Strategy, Content Marketing, Social Media, and SEO.